CORTE MADERA, Calif.--(BUSINESS WIRE)--Nov. 11, 2015-- RH (Restoration Hardware Holdings, Inc.—NYSE:RH) announced today the opening of its first standalone RH Modern Gallery at 8772 Beverly Boulevard, in the heart of the West Hollywood Design District. The 21,000-square-foot indoor-outdoor space has been completely reimagined as a contemporary structure that serves as a canvas for the carefully curated collection of indoor and outdoor modern furnishings, lighting and décor. Additionally, the space will incorporate an RH Contemporary Art Gallery, exhibiting talented artists whose artwork is also presented on its digital platform at RHContemporaryart.com. RH Modern also debuts with its own distinctive 540-page Source Book, a dedicated website (RHModern.com), and national ad campaign designed by world-renowned art director Fabien Baron. "Los Angeles is arguably the creative capital of the world, and has become the epicenter for art, architecture, fashion, film and music," commented Gary Friedman, RH Chairman and CEO. He continued, "In many ways RH Modern reflects the spirit of this great city, as does the work of the many talented artists, architects, art directors, designers and manufacturers who collaborated to bring this new brand to life." Upon arrival, guests will first encounter the gallery’s dramatic exterior of white, polished European plaster and 21-foot-tall glass steel windows that fill the building with fresh air and natural light. 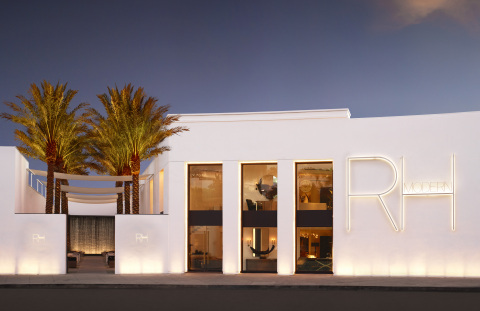 The white-on-white exterior signage – designed by Fabien Baron, who Vanity Fair calls "the most sought after art director in the world" – is itself an art installation. As night falls, the dramatic halo lit signage and embedded LEDs outlining the windows illuminate the façade in a graphic, architectural glow. Visitors will enter the gallery through modern gates of solid stacked steel and step into a sculpture garden with a rhythmic progression of giant white shade sails and up-lit Medjool date palms towering 30 feet overhead. Here, a series of monolithic black concrete slabs embedded in decomposed granite and basalt form a linear pathway and lead guests through the garden to a striking 18-foot-wide by 16-foot-tall wall of cascading water inspired by the famed fountain in New York City’s Paley Park. A perimeter of angular steel planters, Dragon Tree Agave and exotic succulents serves as a backdrop to a dramatic display of RH Modern outdoor furnishings. Also on display in the courtyard is a dramatic print of a photo of RH Chairman and CEO Gary Friedman walking through Random International’s world-famous Rain Room, which is on display at LACMA, courtesy of RH, now through March 6, 2016. RH commissioned the first edition of Rain Room, which was exhibited at MoMA New York in Spring 2013, and became one of the most Instagrammed art installations in history. Continuing indoors, guests will first arrive at the two-story lobby marked by a monolithic staircase with transparent glass and brass railing. Here, they will discover two specially commissioned works of art by famed Los Angeles artist, RETNA, and a spectacular installation of three massive Rain Chandeliers – each composed of hundreds of illuminated crystal rods—suspended 22 feet overhead. Artistic lifestyle installations featuring never-before-seen collections from some of the world’s most renowned designers are further enhanced by museum-quality architectural lighting found within the bright, open white-walled rooms with bleached grey oak floors. Also on the first floor, visitors will find an RH Contemporary Art exhibition space, with additional works integrated throughout the rest of the minimalistic gallery. RH Contemporary Art offers an engaging and curated collection of artwork across all media and presents new opportunities to view, learn about and acquire works of fine art. Level two features an RH Design Atelier – a dedicated studio where guests can work with the RH design team or their interior designers and architects to conceptualize highly personalized, inspiring spaces. RH Modern’s complete library of fabrics, leathers and furniture finishes offered with the latest technology and capabilities support an unprecedented level of design services. The RH Design Atelier also features a Ben Soleimani Rug Showroom displaying the fourth-generation designer’s modern hand-knotted and hand-woven rugs, as well as a select presentation of window treatments and hardware. The RH Modern gallery offers complimentary valet parking. The phone is 424.281.1326. Hours of operation are Monday through Saturday from 10am to 7pm, and Sunday 11am until 6pm. This release contains forward-looking statements within the meaning of the federal securities laws, including statements related to the breadth of assortments under the RH Modern brand, the customer experience when visiting our RH Modern Gallery, the presentation and layout of RH Modern, the Company’s merchandise and business offerings within this location, also including RH Contemporary Art, RH Design Atelier and the Ben Soleimani Rug Showroom. You can identify forward-looking statements by the fact that they do not relate strictly to historical or current facts. We cannot assure you that future developments affecting us will be those that we have anticipated. Important risks and uncertainties that could cause actual results to differ materially from our expectations include, among others, risks related to the number of new business initiatives we are undertaking; our ability to introduce new products and merchandise categories that will be of interest to our customers and to new customers; as well as those risks and uncertainties disclosed under the sections entitled “Risk Factors” and “Management’s Discussion and Analysis of Financial Condition and Results of Operations” in Restoration Hardware Holdings’ Annual Report on Form 10-K filed with the Securities and Exchange Commission on March 27, 2015, and similar disclosures in subsequent reports filed with the SEC, which are available on our investor relations website at ir.restorationhardware.com and on the SEC website at www.sec.gov. Any forward-looking statement made by us in this press release speaks only as of the date on which we make it. We undertake no obligation to publicly update any forward-looking statement, whether as a result of new information, future developments or otherwise, except as may be required by any applicable securities laws.